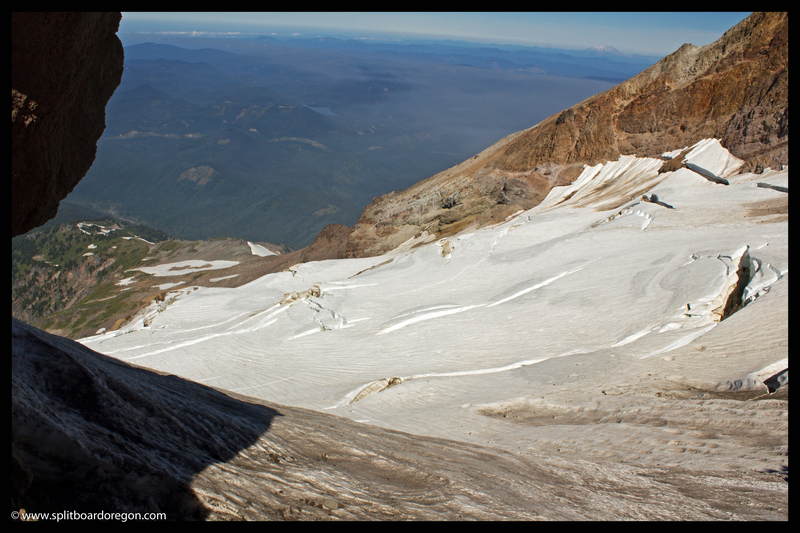 Within about 40 minutes or so of leaving the top of the Palmer, I was standing at Illumination Saddle and looking down onto the Reid Glacier to the west. Riding down onto the Reid looked inviting, but being solo I didn’t venture past the saddle. I hung out at the saddle for about 20 minutes or so, soaking in the views in all directions and admiring the substantial snowpack for this late in the year. 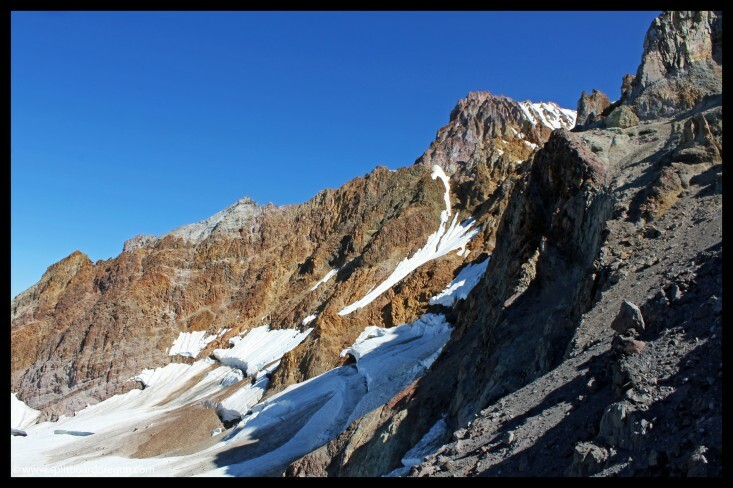 Looking to the north, there still appeared to be some snow in the Leuthold’s Couloir. 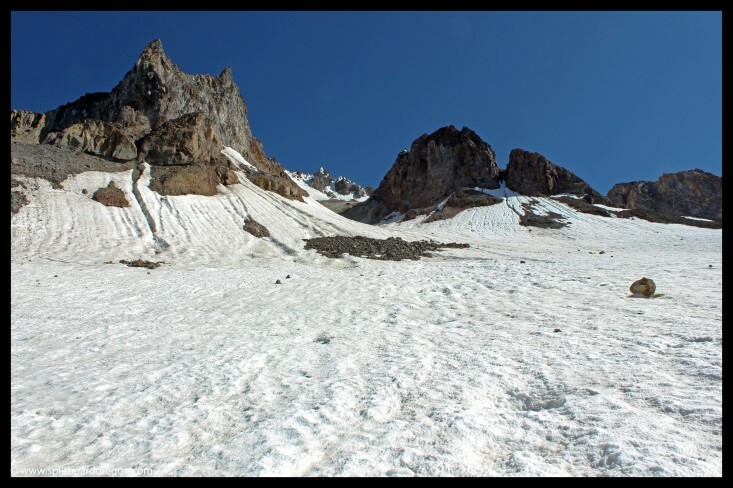 That area looks beautiful and would make for a great ski descent, but is always somewhat dangerous. Maybe someday I’ll ride it when the conditions are right! 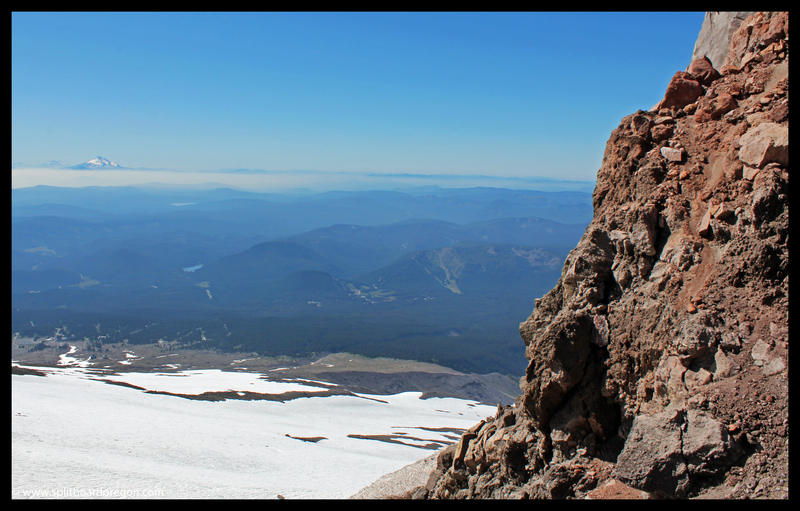 I snapped a few photos, including the one below looking down on the Zigzag Glacier and out towards Mt Jefferson to the south. The haze in the background was from a large wildfire burning near Madras. 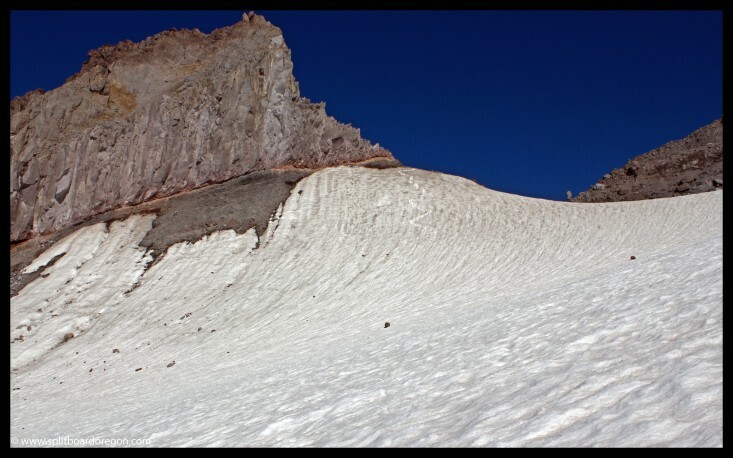 I climbed up the snowy ridge to the high point near the base of Illumination Rock, strapped on my board and proceeded to make some sketch turns down the steeper portion of the slope. The snow was firm and pretty cupped directly off Illumination Rock, but fairly smooth and enjoyable down on the Zigzag Glacier. 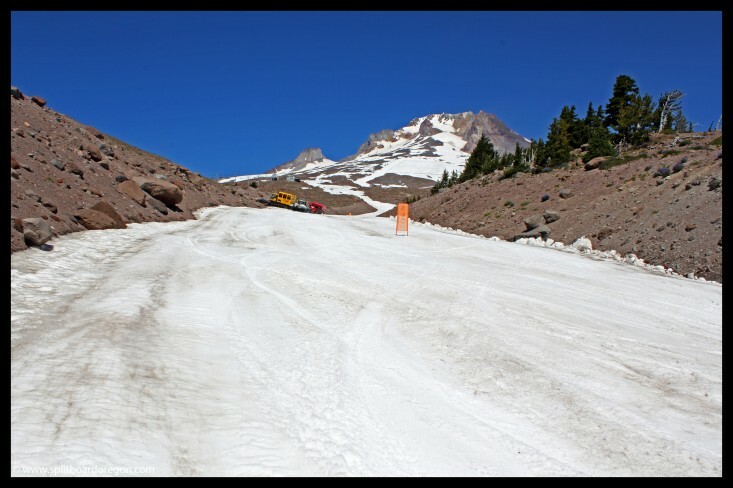 The ski down the Zigzag Glacier was fun. 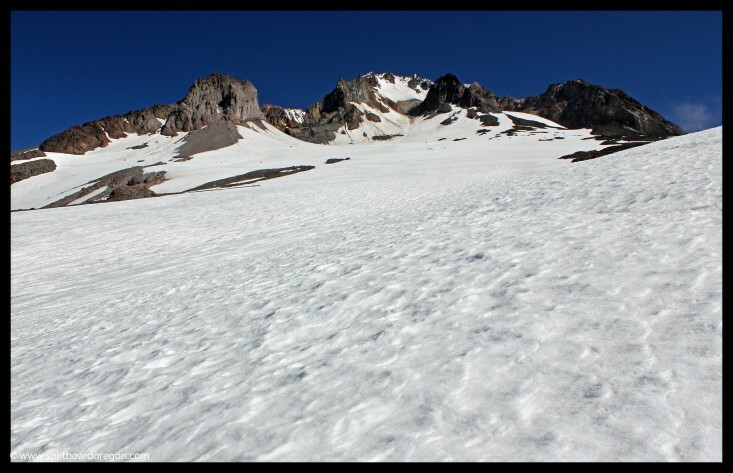 I pretty much repeated our descent line from the previous year, with the exception of riding down to the toe of the glacier near the start of the canyon. 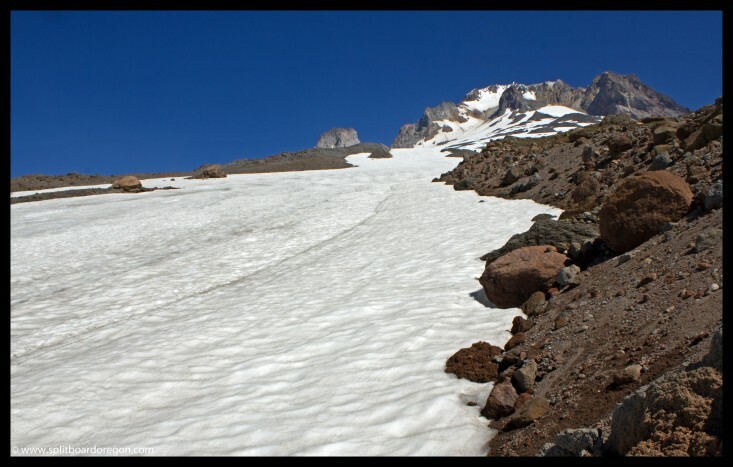 I had to hike back up a bit to link up with the snow finger that descends down to near 6500 feet. I didn’t find any noticeable crevasses on the Zigzag, though for the first time I did see some odd cracks that resembled crevasses (but they were only about 6 inches wide?). After packing my board and gear up, I was back at the ski area within 15 minutes and hopped back on the lift for another 7 or 8 laps on the Palmer before heading down 3000 feet to the parking lot. Riding down in the Mile Canyon, I was able to make turns to within a couple hundred yards of the parking lot! Back at the parking lot, I made a quick change of clothes before making the long drive home, quite satisfied with another September in the books and several thousand vertical feet of turns under my belt! I’m looking forward to what October brings!